you guys, i have very much been looking forward to writing this review. why, you ask? well, i’ve a few reasons. 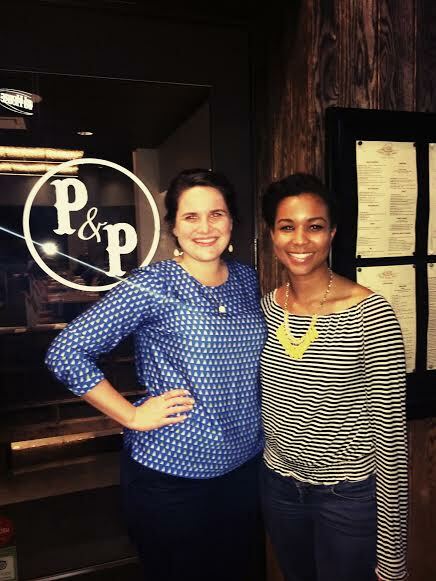 number 1: there were eleven of us at our new restaurant dinner this past week – how exciting! number 2: we were going to a restaurant in atlantic station, and we haven’t ventured there in a while. number 3: my younger brother clark was going to be there with his friend a-dex, and it was her first nrw since moving to atlanta. welcome to the city, girl! and finally, number 4: a fellow blogger alannah was joining us. ah, an adoring fan, what a thrill! alannah has been a loyal follower for many months, and after getting to know each other through our writing, we decided it was time to meet in person. so, just exactly where did we get to enjoy all of these wonderful things? 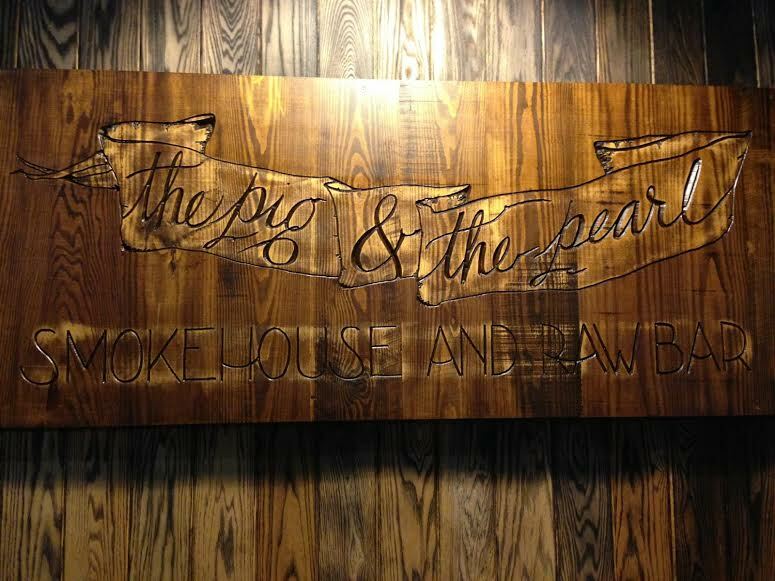 at the pig & the pearl, your “one stop shop for all things smoked.” they serve up the finest cuts of pork, beef, and lamb alongside the freshest raw seafood and shellfish. get it now? pig and pearl? ah, yes, there ya go! as you will soon find out, the sides are also incredibly crafted and pair well with the extensive spirits list. the pig & the pearl is sleek and contemporary without being too modern. it is minimalistic and simple but still inviting. it is comfortable and cool without being too frigid. the concrete floor is sharp and clean. the lighting and décor are intriguing without being distracting. all good things for a dining experience to be. things weren’t too busy that thursday night at the restaurant, so there was plenty of room for our large group. as everyone got seated and the chatter began, i looked to my left at bank and said, “i am just so happy right now. look at us all being together!” it’s a simple thing like a weekly dinner that just makes my heart sing. a round of drinks seemed like a good place to start, and most folks stuck with beer that night. bank, nathan, and i started with a 10 ounce pour of the ommegang rare vos. ommegang is probably top of the list for me, and the rare vos was drinkable throughout the meal. as folks continued to order and receive their drinks, kalyn made the appropriate observation that canned beers at restaurants seem to be the cool new thing to do. i honestly have to agree, as i have had beers served to me in cans a lot lately. but hey, the beer doesn’t know what kind of container it is in, so drink up! we were all very intrigued by the a la carte menu at the pig & the pearl, so when the waitress came around to take our orders, we were ready. although none of us went the pearl route that night, we made up for our lack of seafood with our abundance of meats. i know arby’s say they have the meats, but they haven’t dined at the pig & the pearl yet, and they better watch out for ’em! let’s begin the personal reviews with philip and work our way around the table. 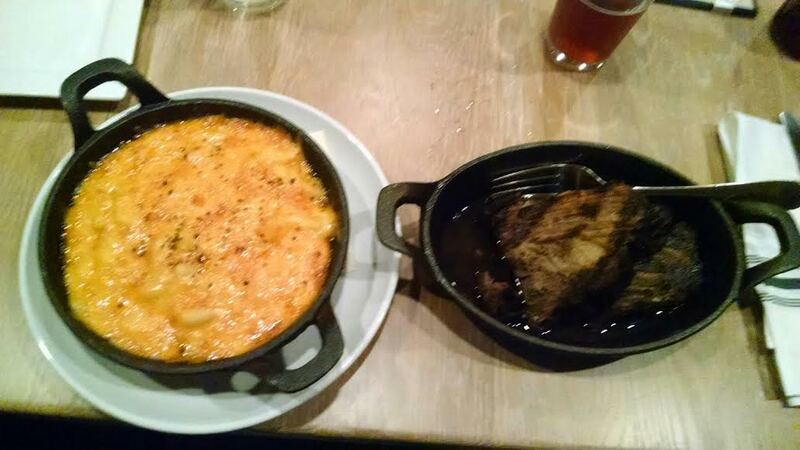 philip had the ten ounce brisket, smoked cheddar mac ‘n cheese, and edna lewis cornbread skillet. philip was kind to share the cornbread with those of us near him, and i’m quite lucky that he did. it was mealy without falling apart and was delicious even without the mole butter. if you want try a bite with the butter, give it a moment before you review it; it goes, you just have to wait to really digest it. ha, digest it! a little food pun for ya. next philip went for the mac ‘n cheese. without a doubt, this side dish was the hit of the evening for everyone who tried it, and we had about six orders scattered throughout the plates and silverware. david, who works in the restaurant business, declared that this was “the way mac ‘n ‘cheese should be made.” it wasn’t too fancy, but it wasn’t too basic either. some of your bites will be more salty, others will taste a little more peppery, but all will be cheesy. a-dex described it as “da bomb,” proclaiming that “cheese = love.” ah, i’m so glad she’s here with us now! nathan wrote that the mac ‘n cheese was “terrible and delicious,” and i assume here, for his sake, that he meant it was terribly delicious. he almost polished off our order. kalyn’s review was a positive one, stating that it was “amazing. creamy, salty, smooth, peppery, cheesy.” i think philip’s review sums it all up pretty well, that this smoked cheddar mac ‘n cheese was “worth every penny.” nicely put, philip! mac ‘n cheese & brisket. philip, along with david, had the 10 ounce brisket for their entrée. david did not leave a scrap in his bowl, but philip had other thoughts. although it was very flavorful and tender (which, thank goodness, because it looked quite overcooked when it arrived), it was quite fatty. the texture was nice, too, but overall, philip thought the brisket was overpriced for what he got. and, to be completely honest, he thought everything, even including his beer, was a bit pricey. the quality was pretty positive all around, but be aware that you might not be getting out of here for under thirty bucks. 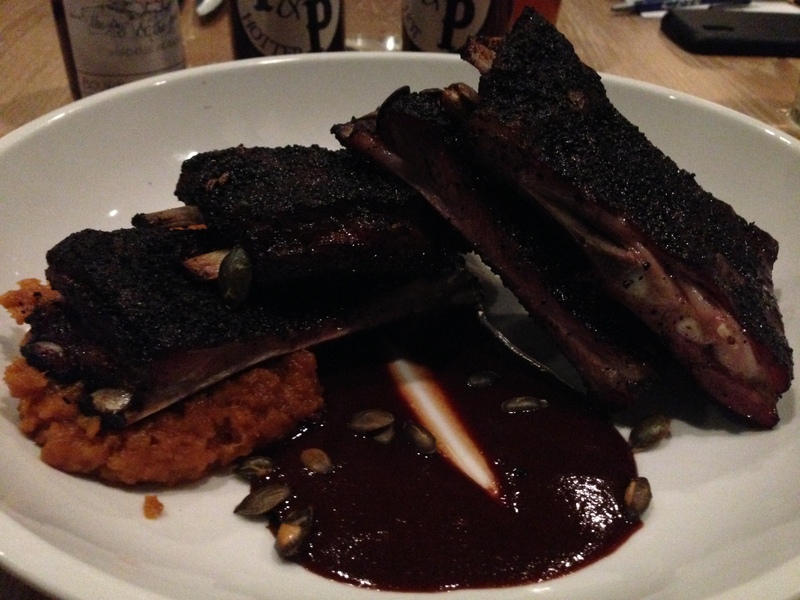 kalyn had seen the coffee ground lamb ribs on the menu and knew she couldn’t pass them up for dinner. her meal was a bit messy, too, as ribs are never the easiest to eat with knife and fork. it is certainly a hands-on dish. the presentation was lovely, but it unfortunately couldn’t make up for the taste. the hot sauce was good and not in your face, but the meat was a bit fatty (seems to be a trend, yes? ), and the coffee grounds didn’t add any flavor at all, really. they were more of an annoyance than anything, and since she let me steal a bite at the end of the meal, i have to agree. next up was jamie who, like me, had the 8 ounce pork shoulder. i think we both equally loved this meat. it was out-of-this-world tender and moist. we both agreed the best part of it was the chewy, charred, crust. i could have eaten eight ounces just of that stuff. the pork didn’t taste too smoky, and it was so perfectly cooked and so flavorful that you didn’t even need a sauce if you didn’t want it. 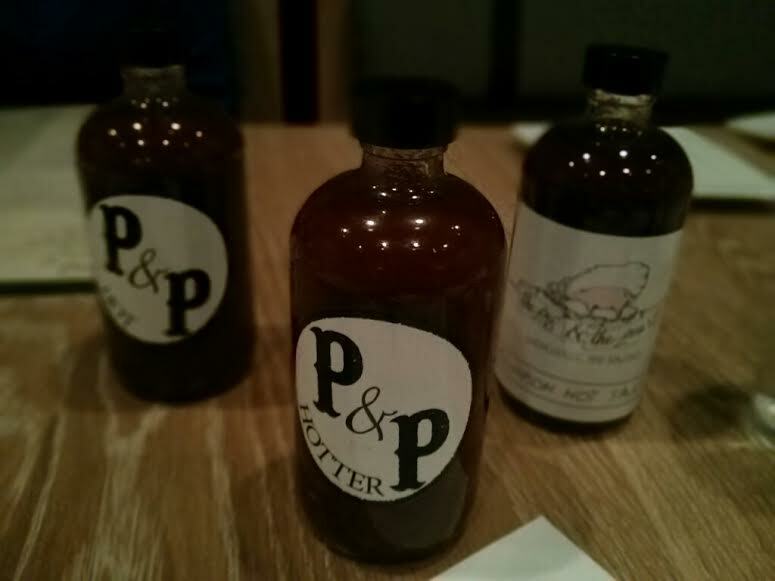 speaking of condiments, the sauces they have here at the pig & the pearl are not truly bbq sauces, which is what you might be expecting. they really are hot sauces, vinegary and thin hot sauces that really add just a little bit of flavor without being overpowering. a-dex and nathan both had the knife and fork pork sandwich (say that five times fast), which really was code for an open-faced sandwich with only one slice of bread as the vessel. a-dex thought the sandwich was really good and that the pork was really tender. nathan didn’t even mind the arugula on top, although, to be completely transparent, most of it ended up on the plate rather than in his stomach. 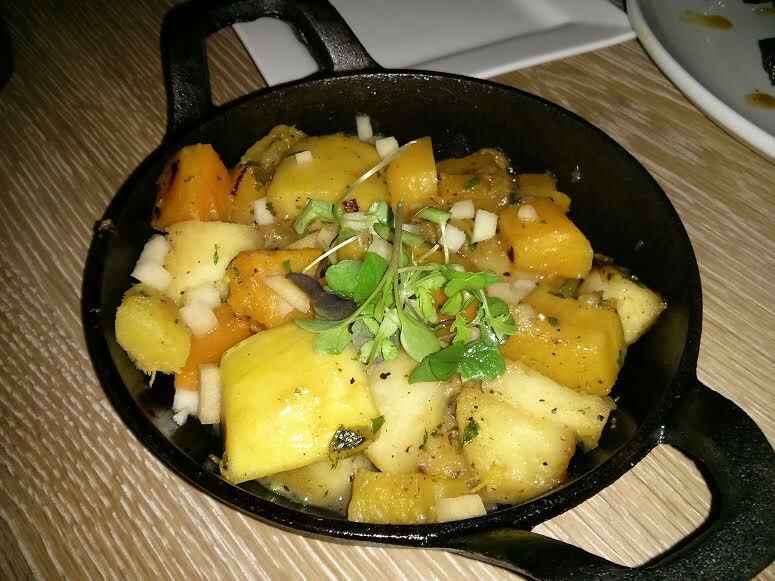 nathan had requested an order of the apple and local squash hash; it was described well enough on the menu to give it a try. nathan said that it was very interesting, and he could tell how people would think it’s great, but he’s not sure it’s his thing. he let me taste it also, and i agree that although it sounds like a good idea, the execution seemed to be a little too bland. i will say, though, that the squash was nicely cooked. down on the end, clark had a pretty great meal. 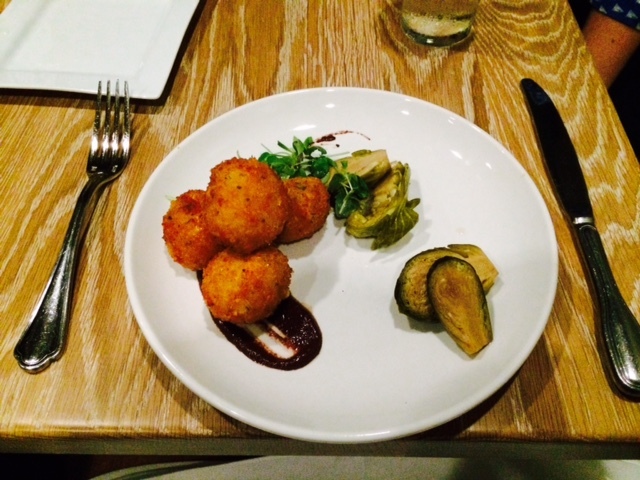 he had started with the pimento cheese croquettes. in his words, it’s “fried cheese, how could it be bad?” it couldn’t. fried cheese is never a bad choice. he shared a croquette with me, and i agree with his sentiment that it was “yum-oh!” the pimento cheese recipe itself was a little more mild, but that cheese was ooey and gooey and not too heavy at all, something every appetizer should strive to be. for his meat, clark had the knife and fork brisket sandwich. in his opinion, it wasn’t terrible but wasn’t amazing either; it could be because he didn’t put any sauces on it, but if you ask any bbq aficionado, i bet they would say that smoked and bbq’d meats need to be able to stand on their own in some way, says the bbq expert…yeah right! anyway, clark liked the sandwich being open faced, and i bet had it actually had two slices of bread, it would have been eaten with utensils anyway. ah, and now we come to miss alannah. she simply asked the waitress what the best thing on the menu was, and voila! alannah ended up with some ribs for dinner. alannah thought they were pretty good but felt they were pretty dry without the sauces, which the ribs desperately needed. eh, not what they should be trying to accomplish, right? she was a trooper and got through a few, though, and packed up the rest for leftovers. and last but certainly not least, let’s talk about bank’s meal. 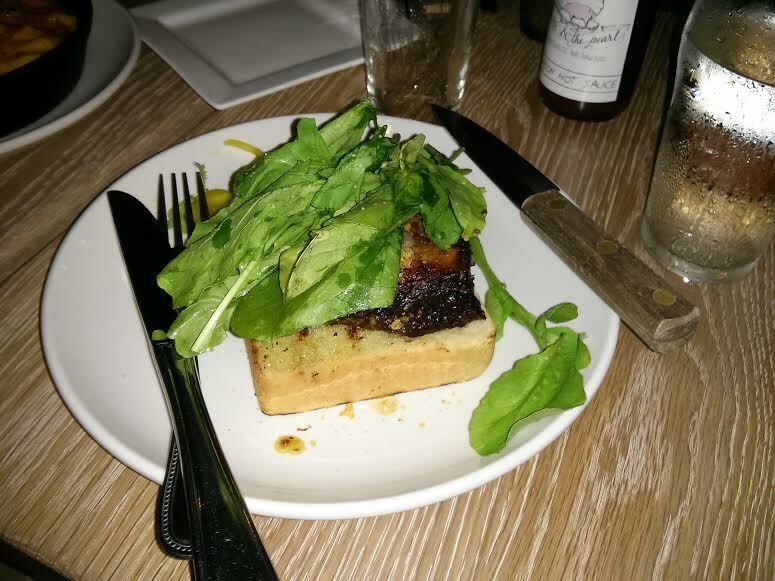 bank had the 5 ounce pork belly that night, and you could tell from the first bite he wasn’t going to be unhappy. that belly really just looked like a one-inch-thick slab of bacon, and that was fine by him. leaving the skin on was a good call to keep things tasty and savory, and the bourbon apple caramel sauce on top was very sweet. he also really liked the grilled brussel sprouts that adorned the dish. i asked him if his trek from otp was worth the trip, and he confirmed without hesitation that it certainly was. success! a group of eleven can be a lot to handle for dinner, but the pig & the pearl accommodated us well. our water glasses were filled throughout the night, and the wait staff was attentive but not nosy. the manager even came by to ask how we enjoyed everything, and it’s those little touches that folks remember when they’re recommending a place. the pig & the pearl is certainly a restaurant i would suggest to a friend, and i know i wouldn’t mind coming back myself. the service was kind and the food was overall great, but i still think my favorite part is that alannah was able to join us. we’re a welcoming bunch, so i’m glad she enjoyed the evening with us. oh, and afterwards i had a sweet tooth, and since i didn’t finish my meal (like always) i had room for some kilwin’s. NOMS. p.s. i had mint chocolate chip ice cream that night that really was pretty killer. what would have made it ultimately killer, though, you ask? if it hadn’t been bright green. when i see mint chocolate chip ice cream that is actually white instead of green, a little part of me has to hold back from eating the entire bowl/pint/gallon at once. there’s almost nothing else like it. not ice cream, but a pretty tree nonetheless.